The B3 Model our System under Study. For the development of multi-omics integrative methodologies we considered necessary to select a system that would allow the generation of both large number of samples and sample material. For this reason, we selected a system, established by the Fisher/Merkenschlager lab (ICL), that models the transition from the pre-BI stage, where B cell progenitors are capable of self-renewal and vulnerable to neoplastic transformation due to high levels of proliferation, to the pre-BII stage, where B cell progenitors undergo growth arrest and differentiation. The approach involves a pre-B cell line, B3, and an inducible version of the Ikaros transcription factor, Ikaros-ERt2. Importantly for STATegra, B3 cells can be grown indefinitely before induction of Ikaros to produce the necessary material for all the omics experiments. This model is relevant not only in the context of basic science, but has clinical interest. For instance genetic deletion of Ikaros may result in severe developmental disturbances such as a complete block in B-cell development due to a failure of lymphoid-primed multipotent progenitors to progress toward common lymphoid progenitors. Additionally, IKZF1 (Ikaros) is frequently mutated or deleted in acute lymphoblastic leukemias, especially in cases with B-cell receptor (BCR)-ABL1 translocations, poor clinical outcome, and a high risk of relapse. Preliminary studies in the B3 system. A preliminary transcription-based study of preB-CD by the B3 cell line (which resembles preB-C’, (Brown et al., 1997; Thompson et al., 2007)) was described in (Ferreiros et al., 2013) where a retroviral gene transfer was used to express either wild-type Ikaros (HA-Ikaros-IRES-GFP) or the dominant negative Ikaros DNA-binding mutant 159A (HA-159A Ikaros-IRES-GFP). See (Thompson et al., 2007) for further details. The positive results shown by (Ferreiros-Vidal et al., 2013) encouraged us in the STATegra Consortia to use it for the development of multi-omic integrative analysis tools. In STATegra we considered the same retroviral gene transfer, however we used instead a wild-type Ikaros, HA-Ikaros-IRES-GFP, and a control case, HA-Ikaros-Control-GFP. In the case of the wild-type Ikaros the gene is transcribed, the protein is translated but tethered into the cytoplasm until the addition of 4-hydroxy tamoxifen; the process is simplified in the following figure. The control case served to differentiate between the effects of taxomifen and the effects of Ikaros. 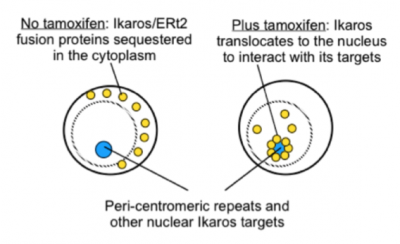 Taxomifen-based activation of Ikaros-ERt2 fusion proteins.